The world has plunged into a "new Cold War", the Russian premier said Saturday, as Moscow came under attack at a global security gathering over its targeting of moderate rebels in Syria. US Secretary of State John Kerry told the Munich Security Conference that "the vast majority of Russia's attacks (in Syria) have been against legitimate opposition groups." "To adhere to the agreement it made, Russia's targeting must change," he said, referring to the international deal forged on Friday, in which 17 countries agreed to seek a "cessation of hostilities" in Syria within a week. "This is the moment. This is a hinge point. Decisions made in the coming days and weeks, and a few months could end the war in Syria -- or could define a very difficult set of choices for the future." 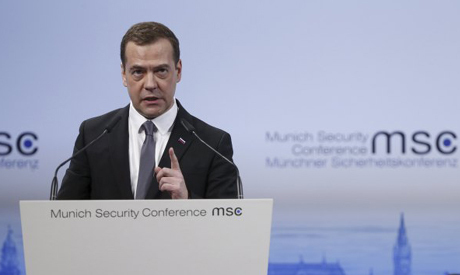 He spoke shortly after Russian Prime Minister Dmitry Medvedev said the world had "slid into a new period of Cold War." "Almost every day we are accused of making new horrible threats either against NATO as a whole, against Europe or against the US or other countries," Medvedev said. His foreign minister, Sergei Lavrov, hit back at Kerry's comments, saying the new deal on Syria could not only focus on Russia's role. "The fact that the discussions on the truce are beginning to go towards prioritising putting a stop to the actions of the Russian air force creates in me suspicions, gives reasons for sad thoughts, about how our Munich adventure will end," said Lavrov. Meanwhile, a panel of eastern European leaders lined up to add their own accusations of Russian aggression. "Every single day, Russian troops, Russian weapons, Russian ammunition penetrate into my country," said Ukraine President Petro Poroshenko. He addressed Russian President Vladimir Putin, who was not present, saying: "Mr Putin, this is not a civil war in Ukraine, this is your aggression. This is not a civil war in Crimea, this is your soldiers who occupied my country." Kerry emphasised that sanctions on Russia would remain in place until it implemented all aspects of the Ukraine peace agreement reached in Belarus' capital Minsk last year. An emotional Poroshenko also warned that "pro-Russian parties" were undermining Europe from within with an alternative set of values. "Isolationism, intolerance, disrespect of human rights, religious fanatics, homophobia -- this alternative Europe has a leader. His name is Mr Putin." By contrast, Medvedev had earlier criticised the expansion of NATO and EU influence deep into formerly Soviet-ruled eastern Europe, which Russia sees as its sphere of influence. But he also struck a more positive note, saying: "Our positions differ, but they do not differ as much as 40 years ago when a wall was standing in Europe." NATO secretary general Jens Stoltenberg also addressed the forum, vowing to combine a firm stance against Russia with more dialogue. "We have seen a more assertive Russia, a Russia which is destabilising the European security order," he said. "NATO does not seek confrontation and we don't want a new Cold War. At the same time our response has to be firm." NATO is "undertaking the biggest reinforcement to our collective defence in decades, to send a powerful signal to deter any aggression or intimidation," Stoltenberg added. "Not to wage war, but to prevent war." Earlier this week, Stoltenberg announced that plans had been approved for an increased NATO presence in eastern Europe -- which sources said would involve between 3,000 and 6,000 troops rotating through the region. Lavrov hit back, criticising the "fashion for Russophobia in some capitals" and the "failure of NATO and the EU to fully cooperate with Russia".